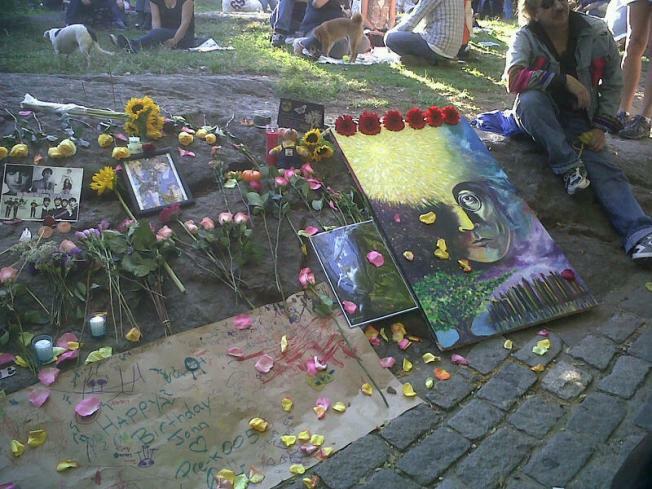 Saturday would have been John Lennon’s 70th birthday, and it was Sean Lennon’s 35th. Here in Manhattan, locals shared the day with quiet tributes—because John always seemed, in every crucial way, our hometown hero. The epicenter was, unsurprisingly, the Strawberry Fields memorial mosaic in Central Park, across the intersection from the austere Dakota building where John lived and died. Hundreds assembled to display their Lennon artwork, shout A Hard Day’s Night quotes, and sing his songs en masse – “Imagine” and “Help!” seemed to resound every hour on the hour, while one determined troubadour kept kicked in his own version of “Let It Be” on the sidelines (er…half points for a Paul song?). Later in the evening, members of his first band, British skiffle rockers the Quarrymen, headlined a tribute concert at the Concert Hall at the New York Society for Ethical Culture. As New York sang, John’s family celebrated overseas; first wife Cynthia Lennon and son Julian unveiled the 18-foot "Peace and Love" monument in his native Liverpool, England. Sean joined Ringo Starr, Olivia and Dhani Harrison (widow and son of George) , and Yoko Ono and the Plastic Ono Band for a performance and ceremonial lighting of the Imagine Peace Tower. In Los Angeles, fans gathered at Lennon's Walk of Fame star in front of Capitol Records in Hollywood and in Cleveland, the Rock and Roll Hall of Fame hosted full weekend of dedications and events. It was a lovely, affecting day – here in New York, over the pond, and across the universe.